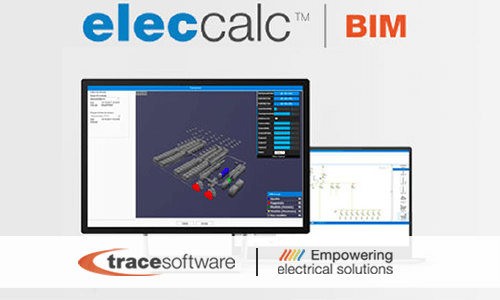 Trace Software International, the global leader in electrical engineering since 1987, announces the official launch of the elec calc™ BIM software, the first tool in the world that seamlessly integrates electrical calculation into the BIM process. When we talk about Building Information Modeling (BIM) we are not talking about a trend, but about a real digital revolution in the building sector, ready to break up obsolete schemes and processes. For a long time, the engineering and construction sectors were looking for tools to increase the productivity and quality of their projects by reducing costs and delivery times. BIM has positioned itself in these sectors as the ideal tool for achieving these goals. Innovation is at the heart of Trace Software International journey. This is why the company has soon followed the digital evolution of Building Information Modeling (BIM) to meet the business needs of construction professionals, integrating calculation and electrical design into the BIM process. 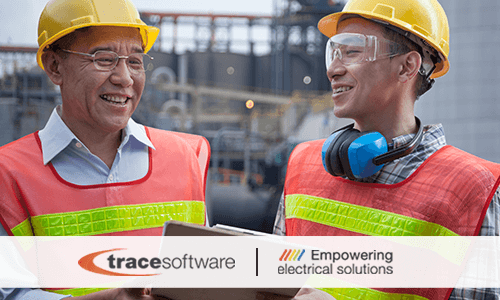 With the commercialization of elec calc™ BIM, Trace Software offers electrical professionals a cutting-edge and innovative software that allows them to improve the performance of their electrical installations dimensioning projects. “With the arrival of BIM, we have for the first time in almost thirty years, an exceptional opportunity to make a profound change in the way we conceive our electrical design software.” With elec calc ™ BIM, the user has at his disposal a digital model, capable of simulating most of the installation parameters, which saves hundreds of hours of work, provides a more rigorous design, and implies an immense economic advantage “, says Etienne Mullie, Trace Software International R&D Manager. elec calc™ BIM offers unique routing capabilities. The user calculates the lengths of the cables generated in the digital model and it is also possible to perform different simulations to compare different routing scenarios. The 3D model allows for conflict detection and the BIM Collaboration Format (BCF) technology, integrated into the software, allows you to manage all communications and alerts with other operators. elec calc™ BIM is the exclusive electrical design solution for professionals who keep up with the times and want to take full advantage of this breakthrough industry innovation. Getting started is easy. Request a trial version. The solar market is booming at a pace never seen before. We have entered a new era, with record growth figures. According to the latest report by the International Energy Agency (IEA) it is expected that the photovoltaic sector will drive the renewable energy market in the coming years, beating the hydroelectric and wind sector. Solar energy is increasingly in direct competition with fossil fuels. A photovoltaic (PV) deployment of 110 gigawatts (GW) is expected in 2018. Which are the contributing factors to the industry’s success? The expansion of renewable energy, such as solar energy, is a key element in improving air quality and the sustainability of the mix of our energy sources. With more attention to alternative and renewable energies, there are many interesting investment opportunities. In 2017, the global investment in renewable energy grew by 2% compared to the previous year, reaching 279.8 billion dollars. It is the solar energy sector that attracts most of the investments with a total of 161 billion dollars in 2016 and a growth rate of 18% in the same year. (UN Environment, Bloomberg New Energy Finance). “The extraordinary surge in solar investment, around the world, shows how much can be achieved when we commit to growth without harming the environment,” said Head of UN Environment Erik Solheim. The decline of the price of photovoltaics has certainly played a key role in empowering the global demand. The International Renewable Energy Agency (IRENA) estimates that by 2020 the price of energy production in large solar power plants could fall to around three US cents per kWh in many regions of the world. Photovoltaic becomes therefore accessible and attractive. In 2017, costs continued to fall for solar, in particular. The benchmark levelized cost of electricity for a utility-scale photovoltaic project dropped to $86 per megawatt-hour, down 15% on a year earlier and 72% since 2009. Some of this was due to a fall in capital costs, some to improvements in efficiency according to the Global Trends in Renewable Energy Investment 2018 Report. The proliferation of solar contracts invites to reflect on the policies of renewable sources. The increased competition has pushed governments to reduce prices, however public incentives are undoubtedly less important than before. The trend is clear, the expansion of the sector will be driven by solar tenders. According to the GTM Research, there are already 53 national markets in which there is currently a call for tenders or an auction program, compared to 32 in the second half of 2016. In addition, there are 29 other national markets where a project has been discussed or planned. Furthermore, power purchase agreements, tenant power, and sector coupling are generating new business models. The archelios™ suite is the state -of- the- art photovoltaic software solution to manage the entirety of a photovoltaic project. 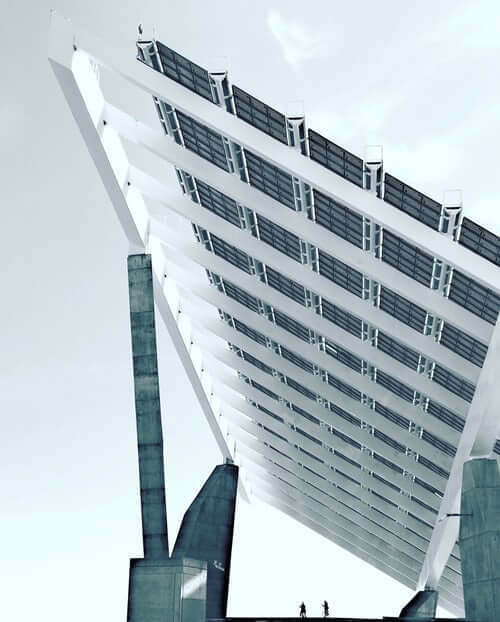 It is the unique tool in the market which allows the solar professionals to increase the performance of the project with the utmost precision. From the feasibility study, bankability, 3D design, to the compliance and calculation notes, right up to the operation and maintenance management, archelios™ suite sharpen your competitive position in the booming market of photovoltaics. With a unique know-how and more than 30 years of experience in the industrial engineering, Trace Software International leads innovation delivering software solutions that disrupt old habits and provide decisive advantages in terms of profitability and safety. 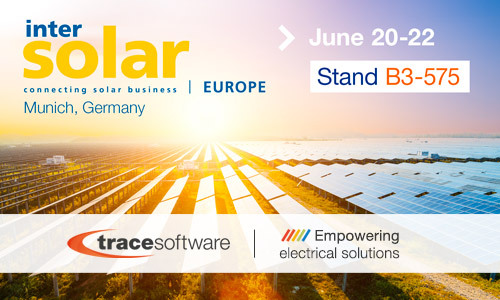 With events spanning four continents and 26 years of experience, today Intersolar is the world’s leading exhibition for the solar industry. More than 55,000 visitors are expected in this upcoming edition. A very promising data which confirms how the event is seriously playing a worldwide major role in connecting solar businesses and increasing the share of solar power in the energy supply. Photovoltaics are experiencing a second wind in Europe, in fact, figures are really positive. 2018 will witness a growth of +30% in Germany, France, Italy, the Netherlands and Spain. It is estimated that deployment will exceed 10 GW for the first time in years. The public incentive has less and less weight in the growth of the sector, which instead is due to the fall in prices and technological developments. Also, political incentives are becoming increasingly common across Europe with the use of public tenders, decentralized “citizen power” generation and net metering. 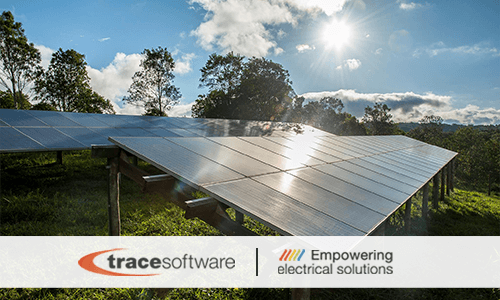 Trace Software International provides the professionals of the solar industry with cutting-edge and state of art software solutions, aimed to simplify processes and improve performance. In a growing market, the archelios™ suite guarantees excellent results in terms of precision, time and productivity. It is a proofed real asset which adds value to the PV project. archelios™ suite is a comprehensive solution with enables feasibility study, bankability, 3D design, to the compliance and calculation notes, right up to the operation and maintenance management. archelios™  is an online application conceived to design, simulate and perform the economic analysis of photovoltaic projects up to 50kWp. archelios™ Pro is the application for the 3D design, simulation, bankability analysis, and the most accurate yield forecast, for any kind of PV installation. 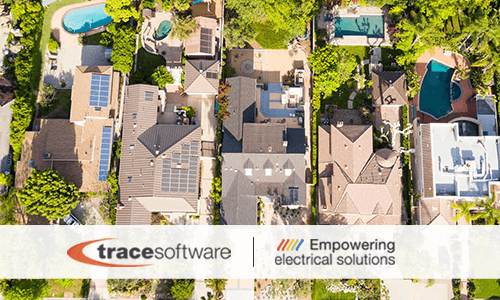 archelios™ Calc is a market leading software for electrical sizing of PV installations linked to the public network of the layout according to the different NF guides and the ICE standards. archelios™ O&M brings all the benefits of PVBIM mock-up design to advanced PV monitoring. Thanks to this 3D model, all data is referenced to BIM and the user can import and access any information from any component of the plant well as pinpoint the location of any failure for a quick intervention. You can request further information at the following LINK.